Mailbox installation may seem simple, but residents need to think about safely before they install a new mailbox Mailboxes that are set firmly into the ground, and/or have large posts can become a fixed object hazard. Mailboxes that are not fixed properly to their support can break loose and become dangerous projectiles, endangering motorists and residents. Standard Mailbox Policy is a file regarding the safety concerns for mailboxes and the Standard Mailbox Policy of the Wexford County Road Commission. Each winter, mailboxes are damaged during winter maintenance operations. More often than not, damage to mailboxes is caused by snow pushing against weakened posts or hardware. If you can shake your mailbox, it probably needs maintenance. Take time now to make any repairs needed so your mailbox will be strong enough to survive the winter. Proper maintenance may help to prevent damage that results in delayed mail delivery, or worse, having to make alternate delivery arrangements. please give your mailbox an aggressive shaking and a thorough inspection every fall. In addition to making sure your mailbox is strong enough to survive winter, clearing snow to the right of your driveway will help reduce the amount of snow deposited in your drive and against the mailbox post during winter maintenance. • Your mailbox is in the road right of way, and is allowed by road commissions as a convenience to you. • Check with your road commission and the US Postal Service for rules and requirements with respect to the construction and placement of your mailbox. 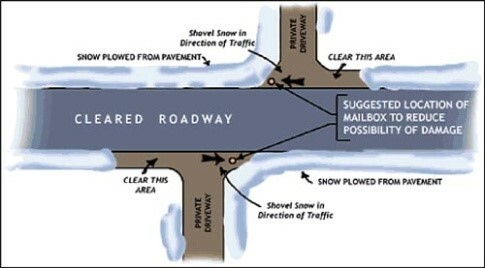 • Flying snow makes it look like snowplow trucks are traveling much faster than they are, but the average speed of travel is about 25 M.P.H. Even at this speed, the force of the snow being pushed off the road can damage mailboxes and other roadside items. • Mailbox replacement policies vary from county to county. If your mailbox is damaged by winter maintenance operations, contact your road commission. Should the need arise, your local post office may provide suggestions for temporary mailbox placement or alternate delivery options. Title VI Signed is a file regarding the Title VI LEP plan of the Wexford County Road Commission. Copyright 2016, Wexford County Road Commission, All Rights Reserved. WEIGHT RESTRICTIONS LIFTED ON Thursday, April 25, 2019 @ 6:00 a.m.